“The fledgling Raw Milk Institute is in trouble. The grandiose plan for a national organization that will at once establish raw milk production standards, educate farmers on improving their safety protocols, lobby for raw milk legislative expansion, and back research into raw milk’s benefits finds itself hobbled by internal dissension out of the gate. “You must have seen this one coming. When the USDA approved Monsanto’s gene-modified (GMO) alfalfa back in January, the Big Ag party line was that Organic producers had nothing to worry about. There was just not that much risk of contamination. 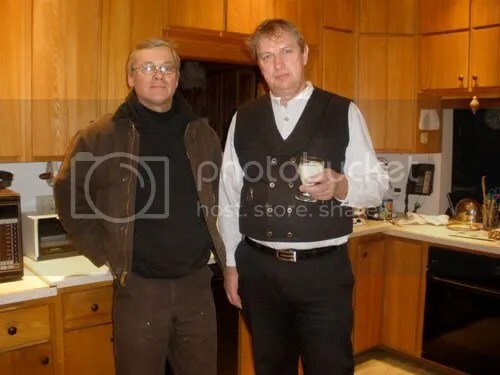 Michael Schmidt with host during a recent visit to Wisconsin, with a glass of raw milk. Things have drastically changed in Ontario since January last year. As soon as the celebration of the historical cow share ruling by Paul Kowarsky was over, many farmers who had been silently waiting on the sidelines jumped at the “golden opportunity to milk the opportunity”. [from a communique from “The Family Cow” raw milk farm in Pennsylvania, which does regular pathogen testing above and beyond government requirements] — “….”Just a few hrs ago, QC Laboratories, the laboratory we use for our voluntary, beyond-the-state-requirement pathogen testing, has reported the presence of Campylobacter in a sample of milk we sent them almost three weeks ago. I’ve spoken with state officials and they report there are no illnesses, but we still want you to know what we found. The milk in which the campylobacter was found was bottled on 1/10/11 and carries a ‘Best by’ date of 1/25. If you still have milk with this ‘Best by’ date, please discard it. Although, with milk that old, it’s probably long gone. Scott Trautman and Michael Schmidt made a presentation at the Trautman Farm exploring individual raw milk safety and quality concepts. 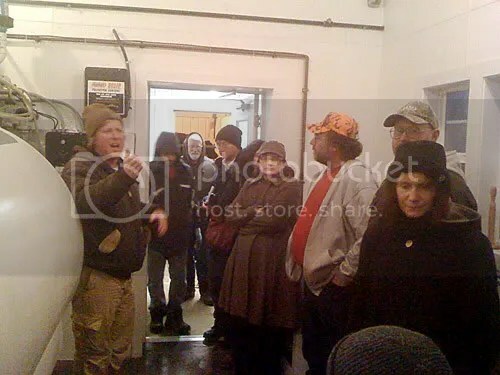 Scott Trautman explains practical details of his quality raw milk program.